That is a stupid topic. All the favorites I’ve been talking about are books I own. What is more, it is highly unlikely that a person’s choice for this would differ from their “favorite book of all time,” the meme’s final topic. So I’m flatly rejecting it. This topic shall not even receive from me the dignity of memetic modification; rather, it is hereby banished and replaced with something that, I hope, is a bit more interesting. Today’s new topic is: A Book Or Series That Is A Guilty Pleasure. The term “guilty pleasure” is more often heard in connection with movies. Some movies, they say, are just So Bad They’re Good. You know the story is weak, the acting may be embarrassing, or the special effects weak, but somehow you always have a good time watching it. Maybe the movie is unfailingly optimistic despite its mediocrity, maybe it taps into some secret, buried wish of yours, or maybe it’s just plain goofy. Well, books can be like that too. 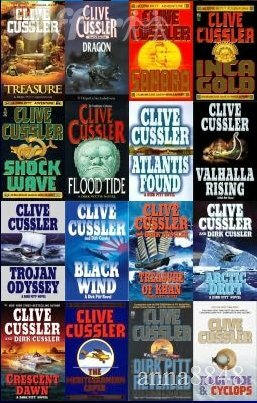 And my pick is the Dirk Pitt series by Clive Cussler. These books are not great literature, but boy can they be fun. Dirk himself is a cross between Indiana Jones and James Bond, with a passion for deep-sea diving and old shipwrecks, and he functions purely as wish-fulfillment for the author. He’s the man all women want and all men want to be (so his reputation goes). And personally, I wouldn’t mind being tall and athletic like him, with combat training, a brilliant scientific mind, an encyclopedic knowledge of history, just about every skillset an adventurer could possibly need (rock climbing, deep sea diving/swimming like a fish, sailing, flying, gliding, parachuting), solid friends in every position and industry to lend a hand when I need them, and of course that awesome collection of classic cars kept in the aircraft hangar that would be my home. At least I have a slice of his rakish sense of humor. The stories are action thrillers, often with Bond-like villains with plots that will end up greatly damaging the world at large; the more implausible ones often make for the better books. Characters don’t have much depth, but they are lively and entertaining. In particular, the friendship between Dirk and Al Giordino is well-played throughout the series; they have an easy camaraderie and act like brothers, holding each other accountable and saving each others’ lives repeatedly. Part of the fun for me was always the historical content. Every book begins with a prologue dramatizing some historical incident – usually a shipwreck or a treasure getting lost, and often fictional – which will form the background for the current adventure. Most of the main characters are historians as well as scientist-adventurers, and they revel in uncovering the secrets of the past. It’s not usually done gracefully – Mr. Cussler has a tendency to info-dump – but if you like history, as I do, then it’s interesting, and it provides some backbone to the ensuing adventure. My favorite, as I remember, is Atlantis Found. It had one of the most preposterous plots, involving lost Atlantean ruins under Antarctic ice, the rise of the Fourth Reich, and something about another Great Flood that the neo-Nazis were trying to escape by building massive high-tech Ark ships. But that was why it was so much fun – the ideas were so big and colorful that it gave our heroes some more unique backdrops for their spying, intrigue, and action. You may vaguely remember the movie Sahara, which was based on one of the first novels in the series. As an adaptation it is horrible: Matthew McConaughey bears little resemblance to the suave, dark-haired, green-eyed Dirk, and Steve Zahn is even farther from the stout, dark Italian Giordino who is Pitt’s best friend. Still, the two actors do have a similar camaraderie that is pleasant to watch, and the movie does manage to keep the same atmosphere of fun history-inspired adventure, better, I think, than the National Treasure movies.